Drinking water for the Cave Creek Water System begins its journey at the Central Arizona Project (CAP) canal at Deer Valley Road in Phoenix. Water is withdrawn from the canal and pumped approximately 12 miles to our Water Treatment Plant on Basin Road. At this location, the water is filtered and treated to meet EPA Drinking Water Standards. 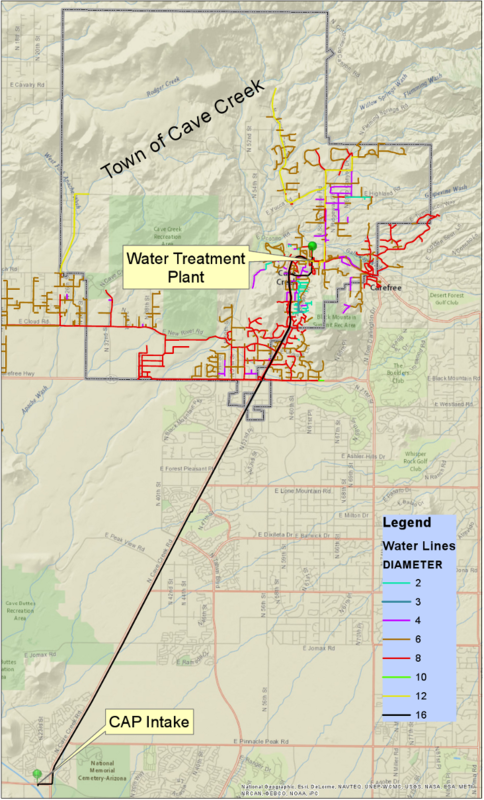 The Town's major water system components include several active groundwater wells, storage tanks, booster pumps, one surface water treatment plant, and approximately 100 miles of distribution mains ranging from 2 to 16 inches in diameter. Water samples are collected on a weekly, monthly, and annual basis in order to ensure that the system is providing the highest quality water possible. 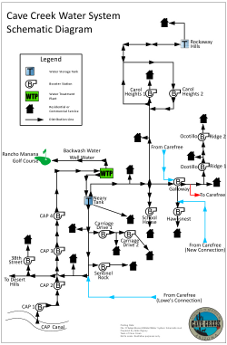 Below is a map of the water distribution system and a schematic of how water is distributed throughout Cave Creek and portions of Carefree. For additional maps click here.